This page highlights Artstor content related to the history and culture of Latin America, including images of works of art and architecture, from traditional forms to contemporary works, as well as photographs of historical events and figures. Image credit: Paracas. 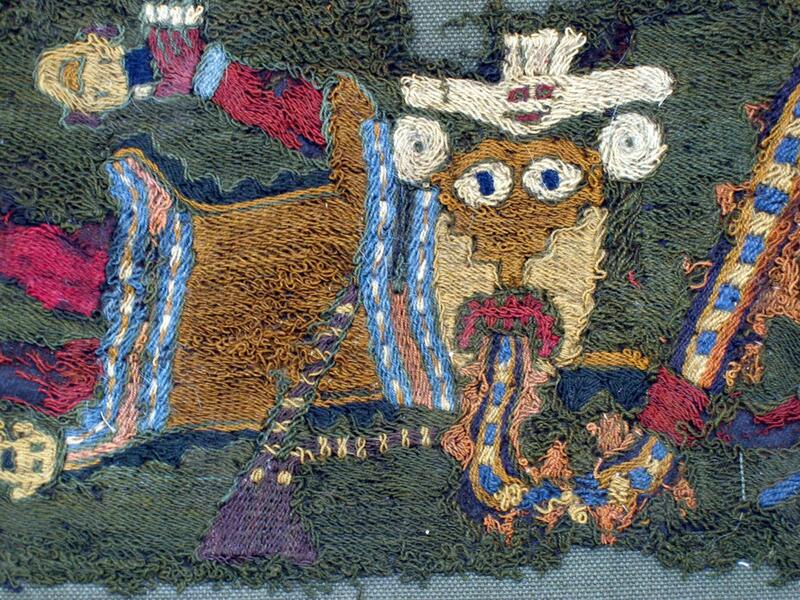 Embroidered Fragment with Figures. 3rd-2nd century B.C. Image courtesy the Metropolitan Museum of Art. Browse by geography to choose countries in Latin America, then select a classification (e.g. paintings, sculpture). Browse museums with encyclopedic collections (e.g. The Metropolitan Museum of Art or The Cleveland Museum of Art) by classification, then by countries in Latin America. Keyword search for the names of historical figures (e.g. Simon Bolivar), political leaders (e.g. Fidel Castro), or individual writers and artists (e.g. Pablo Neruda or Jose Clemente Orozco). Try these sample search terms to find images related to Latin American studies. Don't forget to use the search filters to narrow your results. Douglas Massey (Princeton University) and Jorge Durand (University of Guadalajara) have shared images of retablos, which they photographed for the book Miracles on the Border: Retablos of Mexican Migrants to the United States (University of Arizona Press, 1995). Massey and Durand examined these contemporary examples of traditional religious folk art as sources of sociological data for the experiences of Mexican migrants to the United States. The archive from the Carnegie Institution of Washington Photographs of Mayan Excavations (Peabody Museum of Archaeology and Ethnology, Harvard University) contains 44,000 images documenting archaeological digs of Mayan sites from the lowlands of Peten to the highlands of Guatemala at sites such as Uaxactun, Copán, Pedras Negras, Yaxchilan, Coba, Quiriguá, Tayasal, Kaminaljuyu, and Chichen Itza.